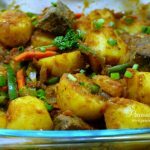 African food recipes, family-friendly meals, African stories. 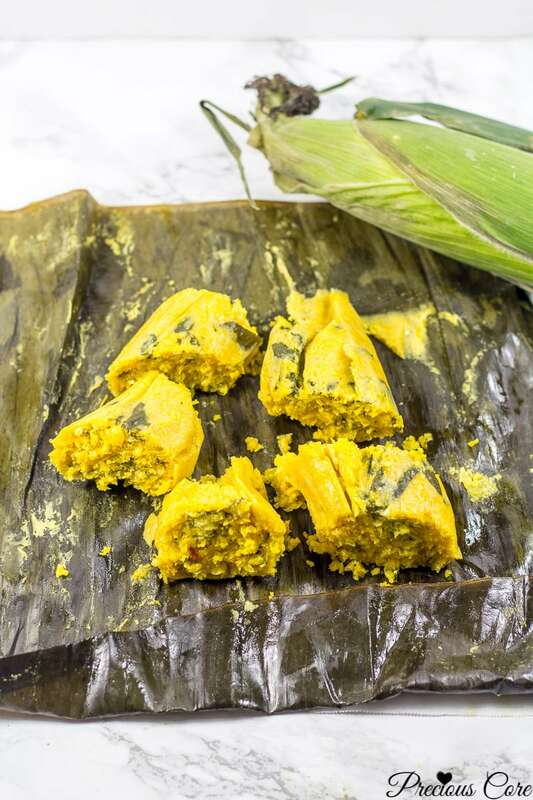 Koki Corn aka Cameroonian fresh corn tamales for the win! One of the reasons why I’m totally in love with this season is the abundance of fresh corn in the grocery stores. And the fact that my favourite farmer’s market is opening soon! I can’t wait to enjoy all the goodies aka fresh vegetables from the farmer’s market. I love to shop there. It kind of reminds me of what shopping is like in Cameroon. Sometimes you bargain, sometimes you argue with the trader, sometimes the trader becomes your new friend. It is fun. Even more fun is the fact that with all the fresh corn around I get to make lots and lots of Koki Corn or “the yellow food” as my girls call it. You guys, I’ve been in some sort of Koki Corn frenzy these days. I’m not ashamed to say that I have made this 3 times the past few days. It is the ultimate corn dish – sweet and savoury, corny, so tasty AND vegan. What’s not to love? 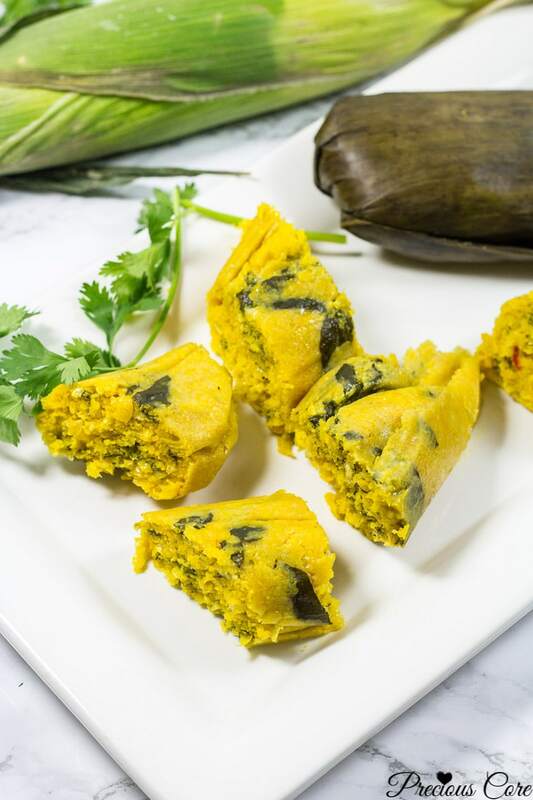 Koki Corn is the African version of Mexican fresh corn tamales. Corn is ground, mixed with ingredients then wrapped in banana leaves (or aluminium foil) and cooked. 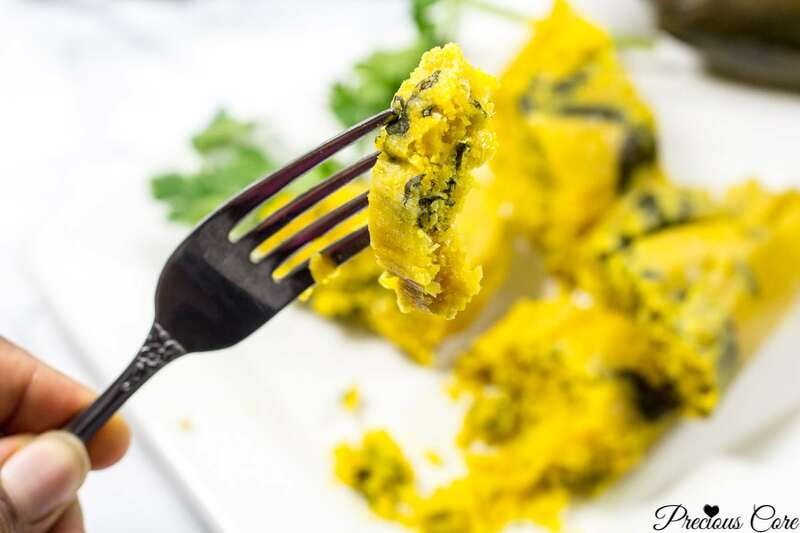 I love to call it Cameroonian fresh corn tamales. 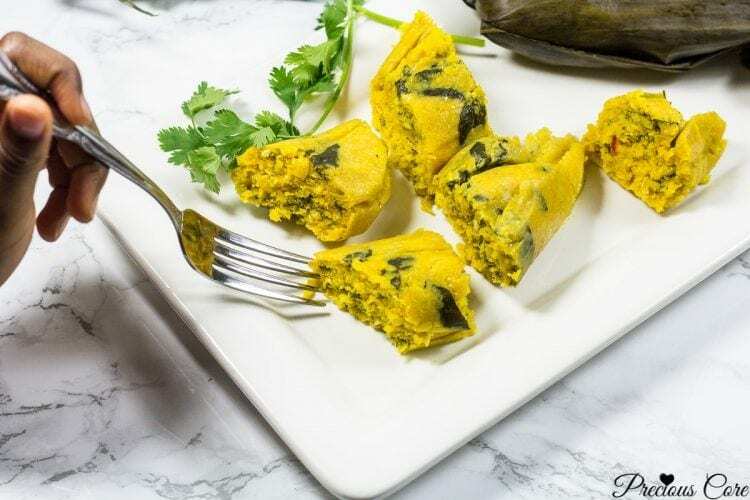 My Nigerian friends would probably call this “corn moin moin” because it is like moin moin, a savoury pudding made with blackeyed peas. 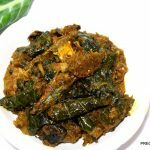 The difference is this one is made with corn then some leaves are added to it just like with Cameroonian Koki Beans. I just love meals that are made this way – the wrapping and steaming way. I used banana leaves to make my bundles but if you do not have banana leaves, go with aluminium foil, my friend. The recipe is quite easy though it might be a little labour of love. All you need to do is cut some corn off the cob (or use frozen sweet corn or canned corn). Then you coarsley grind the corn mix with some ingredients, wrap, steam and enjoy your life! Who wants to eat some Koki Corn? I made a video to walk you guys through the process of making these beauties. To make sure you do not miss any of my videos, please subscribe to my YouTube channel. Thanks to everyone who has already subscribed! 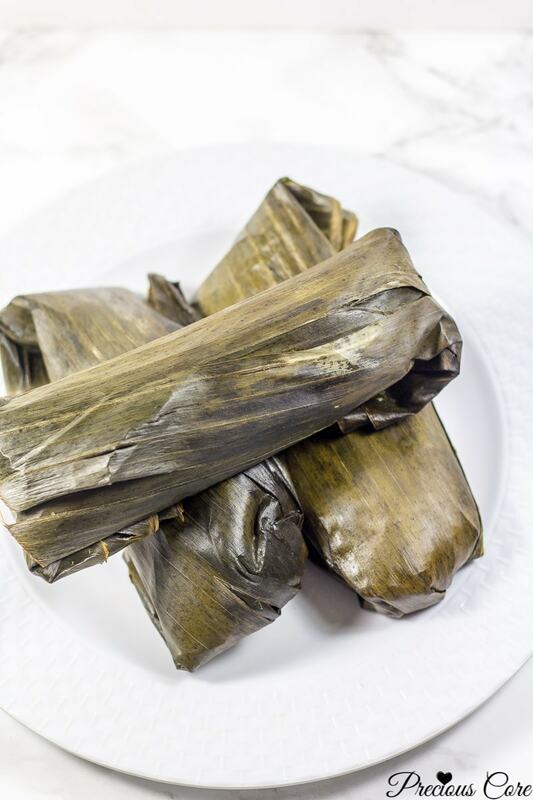 This is the recipe for Cameroonian fresh corn tamales which are made by wrapping ground corn in banana leaves then steaming until done. 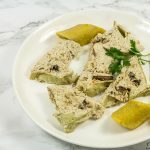 It is vegan, requires minimal ingredients and so delicious! Though it is vegan, I love serving it with some sort of protein on the side like my perfect grilled chicken to make for a balanced meal. You could serve with any protein you prefer. Pour palm oil into a skillet to warm for a few minutes (about 2-3 minutes). Do NOT bleach it. Pour the corn, onion and hot pepper into a blender or food processor. Add 1/4 cup of water and blend or process into a coarsely ground paste. Note that you do not want to blend this into a fine paste. You should still be able to see bits and pieces of corn when done. Pour the ground corn into a bowl, add corn meal, the heated oil and mix well. Add salt, Maggi then mix. Add in the chopped leaves and mix until well incorporated. To prepare pot. Line the bottom of a pot with empty cobs of corn. This creates a base that helps prevent water from getting into the Koki Corn. Now pour about half a cup of water into the pot and bring to a gentle boil while you proceed to wrap the Koki Corn. When done with wrapping and all the bundles are in the pot, cover them with some more banana leaves (mostly the ones that got torn and were unusable) or aluminium foil. This helps to prevent the steam from escaping during cooking. Place lid on the pot and cook for about 30 minutes. Every 5-10 minutes, open pot and add in about half cup of water so it doesn't dry out. Let it rest for about 10 minutes when cooked. Then unravel and serve warm. If using hard African corn, you will not need to add corn meal to your mixture. The corn is starchy enough and will hold well. Howver, if you are using soft sweet corn, adding corn meal is a must. Without this, your Koki Corn won't hold as a cake. It will turn out mushy. 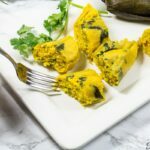 I have found that corn flour is a great replacement for corn meal in this recipe. I once added crayfish (small dried shrimp) to my Koki Corn mixture and it tasted so good! You could try this too. Dear Precious, thank you very much for the KOKI CORN. You have taken me 50 years back into my childhood. This was one of my mother’s favorite meals during corn periods. I feel like going back as a child to my village just because of KOKI CORN. Unfortunately my mother is no longer there. Don’t ask me where she has gone! Awww your comment made me so happy! I’m so glad to be to able rekindle childhood memories for you. God bless your mom. I love Koki Corn too. It is just too good! Wow!! Precious u are a darling, Thks for d recipe, will try it tomorrow. You are most welcome, Doris! Yay!!! I love me some corn moi moi. that’s how I know it here in Nigeria, Precious. yes, it’s corn season here too. great shots you captured there. I even notice that you are now adding nutritional facts to your recipes,that’s excellent. Precious why don’t you start up a culinary school for students or better still start a catering business because you really good at what you do. I mean, you were born to do this. Awww Dominika, I’m flattered by all these suggestions you have given me. Thanks for your kind words, dear. You are very welcome, Melvis! Is it good for someone on diet? It is a good vegetarian dish. It is starchy though so it’s not exactly a low calorie meal. I would say reduce the oil if you want to reduce the calories. Strong corn is hardly sweet so for best results, use fresh soft corn if you can. You are welcome, Ashley. Thanks for the feedback. Awww thanks Ita. You are so kind. Thanks Precious. Please you said crevish sounds good on it? I want to cook it tomorrow. Need advice. Thanks dear. Yes Nella, crayfish is so delicious in it. Please let me know how it goes. This sounds delightful – I am thawing the corn I took off the cob a couple of months ago and plan to make this tomorrow. I may try half corn meal, half corn flour, just for texture. Definitely adding the onion and hot pepper! Don’t have banana leaves, will make do with foil. Thanks for this wonderful recipe! You are most welcome, Maggie! Please let me know how it goes. 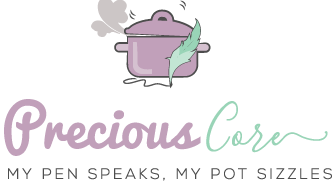 Precious – getting ready to make the recipe. You say to heat the oil. What do I do with it? Am I supposed to cook the corn and onions and peppers in it? Just the onions and peppers? I don’t want to mess this up, but after telling us to heat the oil, as far as I can see oil is not mentioned again. So, I want to be careful. Thanks – can’t wait to try this! Update – I just found your video! Now I understand. 🙂 My only problem now is finding red palm oil *sigh* I was thinking it was for sautéing, not particularly for flavor, and was going to use another oil. But I have a feeling that using any other oil will really change the flavor, so now I’m off on a search for red palm oil! Que preciosa, Precious! I am Liberian-American but have lived in Mexico for many years. 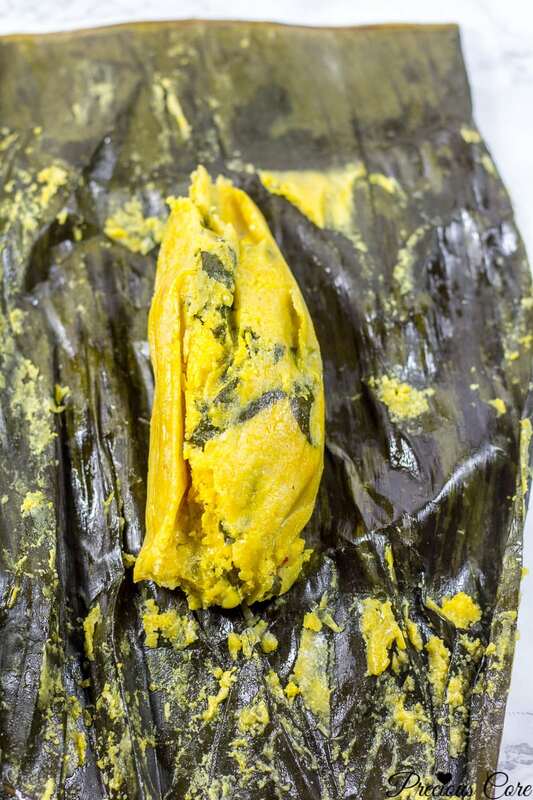 I had no idea that tamales are also made in African — what joy! Are there other dishes that have traveled to Mexico from Africa, or vice versa?! Love your Instagram, Youtube channel, and blog — thanks for sharing! Awww, thank you Mennlay! The world is such a global village! Have you tried Jollof Rice? It is somehow similar to Mexican rice. Thank you so much for following and for leaving a comment here. You totally made my day! 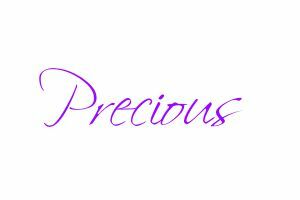 My name is Precious, for real! And I'm so glad you are here! I change diapers, cook food and write things. 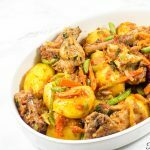 Here is your one-stop shop for African food recipes, family-friendly recipes and more. I love Jesus and coconut. Welcome to my core! NEVER MISS A POST! SUBSCRIBE!